Woody Harrelson is an American actor, best known as the bartender on the long-running sit-com Cheers. In movies, he has played a serial killer in Oliver Stone's Natural Born Killers, a pornographer in Milos Forman's The People vs. Larry Flynt, and a buffoonish FBI agent in After the Sunset. Harrelson made his Broadway debut understudying Matthew Broderick in the lead of Neil Simon's Biloxi Blues, and was briefly married to Simon's daughter. With his second wife, Laura Louis, Harrelson runs VoiceYourself, a mildly but enthusiastically subversive group for environmental activists, organic foods enthusiasts, and lefties in general. An outspoken environmentalist and marijuana consumer, Harrelson once climbed the Golden Gate Bridge to make some political point, and feigned surprise when police had to shut down traffic on the bridge, holding up thousands of commuters for hours. He has also put his money where his mouth is on some occasions, posting hundreds of thousands of dollars in bail for friends busted on marijuana charges. 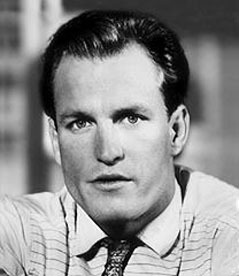 Harrelson narrated the 1999 pro-pot documentary Grass. Harrelson is part-owner of a hemp-clothing company, and in June 1996, he planted four industrial hemp seeds in Kentucky, with video cameras rolling. His intent was to publicly challenge that state's law, which does not distinguish between industrial hemp and marijuana. He lost his philosophical argument when the Kentucky Supreme Court ruled that industrial hemp was as illegal as its reefer cousin, but he was spared a jail term when jurors refused to convict him of planting the seeds, despite the videotape. Harrelson's life took an odd turn at the age of 17, when his father was hired to kill U.S. District Judge John H. Wood, and did the deed. It sounds like a wild rumor, and the Harrelson family disputes the charges, but the verdict is in and a requested retrial has been denied. There is no substantial evidence, however, to back up the persistently whispered rumor that Harrelson's father was also one of three homeless men arrested on the "grassy knoll" in the aftermath of John F. Kennedy's assassination. Charles Voyde Harrelson died in 2007 at the Supermax facility in Colorado.